How Much Do Hair Transplants Cost Around the World? Aside from researching the credentials and reviews of the surgeon and the clinic, when you’re thinking about having a hair transplant abroad, a major factor is cost. But it isn’t just as simple as looking up one cost as each clinic has their own pricing structure and they’re not easily comparable. Whilst you probably have an idea of the size of the area of your scalp you’d like treated, it’s unlikely that you’ll know exactly how many individual follicular unit grafts you’ll need. It would even be tricky for an experienced surgeon to be able to accurately predict that! Most surgeons would only be able to estimate how many you’d need. For this reason, some clinics cannot give you a final cost for your hair transplant until they’re finished. All they can do is give you a ball park figure. But, there are some hair restoration clinics that are more upfront with their pricing and have one fixed fee for a hair transplant. We are one such clinic. Because we understand how confusing it can be comparing clinics and prices, let alone which country you want to have your hair transplant in, we have a transparent pricing system. Our all-inclusive fixed price is £2,000, unlimited grafts. This cost includes your hair transplant operation using the advanced Follicular Unit Extraction, or FUE, method along with a Platelet Rich Plasma, PRP, treatment to help your scalp accept the transplants and to heal. It also includes a three or five-night stay at our partner and transfers from the airport to the clinic/hotel. Some clinics might also look cheaper because they use the older Follicular Unit Transplant, or FUT or ‘strip harvesting’ method. FUE is considered the gold standard nowadays and many clinics now don’t offer the FUT method. If they do, it can mean they haven’t kept up to date with technologies. Not only do we have a transparent pricing structure, we also want to make your research as simple as possible. So we’ve done much of the research for you! We’ve looked at the pricing of hair transplants in some of the most common countries carrying out the procedure around the world. It’s important to remember that some clinics charge a set fee like us, and some charge per graft. Some include accommodation like us, and some add on extra costs for hotels and other things such as medications. 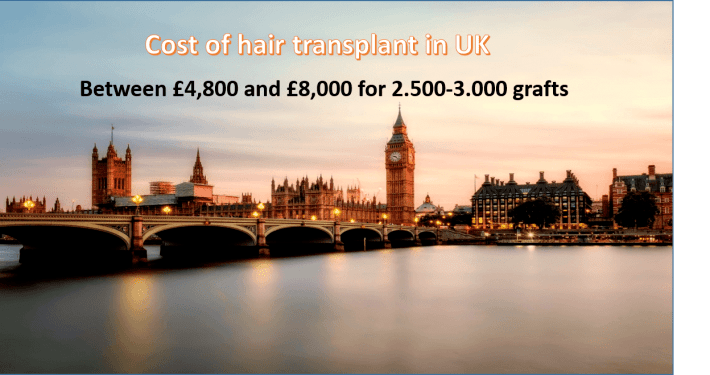 How Much Does a Hair Transplant Cost in the UK? Having a hair transplant, like any other cosmetic procedure, in the UK can be pricey. Which is why so many Brits now choose to travel abroad for their procedure. The average cost in the UK varies, and although rumours that Wayne Rooney’s hair transplant cost anything from £15,000 to £32,000 we found a much lower, although still expensive, average cost than this. Harley Street Healthcare with clinics in London, Essex, Birmingham and Manchester range in price from £1,999 for 500 grafts using FUE to £4,799 for 3,000 grafts using FUE. They do go up to 3,500 grafts and can add on PRP treatment but their prices for these are only available on arrangement. The Private Clinic, who have clinics all over the country, charge roughly £2.50 per FUE graft. This means that 500 grafts here would cost £1,250 and 3,000 grafts would cost £7,500. At the pricier end, we found the Ziering Clinic with locations up and down the UK. 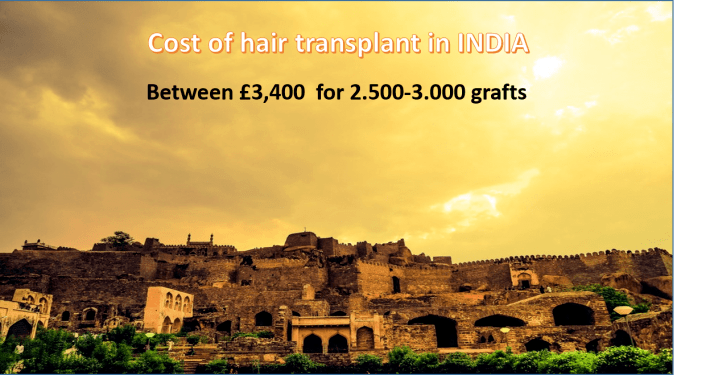 Their prices start at £5,000 for 1,000 FUE grafts up to £10,000 for 2,500 FUE grafts. In the UK, many clinics price per graft and generally, the more you have, the less it costs per graft. As you would expect, the cost of a hair transplant in India is one of the lowest on our list. The hair restoration market here is emerging as a serious contender. Many Indian hair clinics offer a free consultation and some also offer a PRP treatment too. Costs tend to be grouped per 1,000 FUE grafts. So for 1,000 grafts expect to pay around £1,000 and for 2,500-3,000 expect somewhere around £3,400. Most of us know that the vibrant and fast-paced cities of India often appear to have a different level of hygiene than in the UK or Europe. This is great if we’re visiting the country for a holiday. There’s nothing better than experiencing the culture of another country. But in a medical setting, it’s crucial that cleanliness is paramount. This is something worth putting in extra research for if having a procedure in India. It’s also worth considering the extra costs, and discomfort on the way home after your hair transplant, of the long-haul flights. However, we’ve also found many clinics they have good reputation and looks clean, professional. Turkey is the world leader in terms of how many travel to the country for a hair transplant. It’s here that you’re more likely to find all-inclusive packages such as ours. It’s really established itself as a centre of excellence for hair restoration and sees thousands of overseas patients every year. We found packages ranging from £1,800 for 2,000 FUE grafts to £2,600 for 3,000 grafts. Many claim to be as cheap at £1,600 for a package but they didn’t specify how many grafts were included. Read: Is Hair Transplant a Historic Opportunity or a Threat for Turkish Health Tourism? How Much Does a Hair Transplant Cost in Poland? 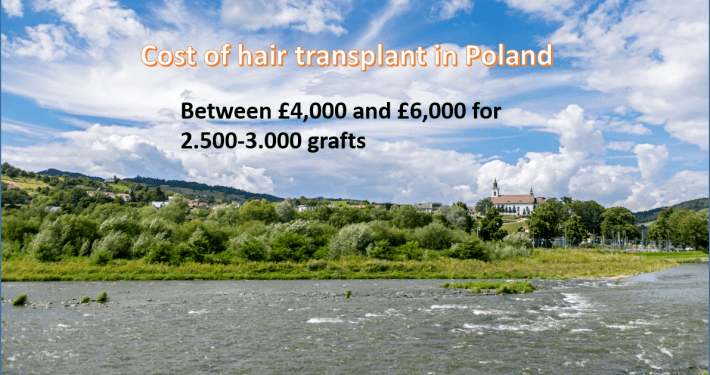 Polish hair restoration clinics tend to charge per graft and is usually around £1.75 to £4 per FUE graft. This usually also includes the cost of accommodation too. Most of the hair restoration surgeons in Poland have been trained overseas. 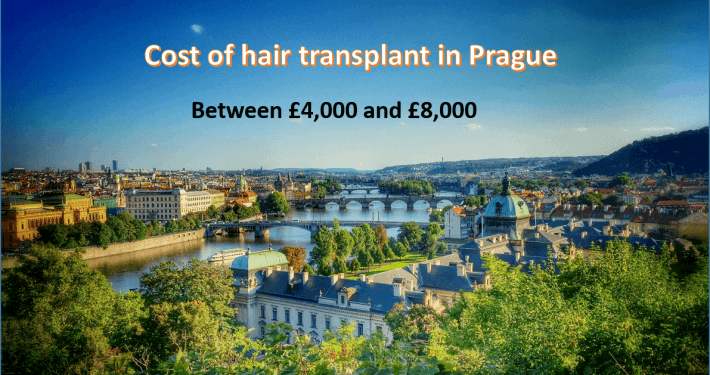 How Much Does a Hair Transplant Cost in Prague in the Czech Republic? The city of Prague in the Czech Republic is another up and coming place for hair transplants. Many hair restoration clinics in Prague keep their pricing hidden until you’ve had a consultation. But we did find a few that gave estimates. We found estimates starting between £1,100 and £1,300 for 300 grafts and from £4,000 and £8,000 for 2,000 and 3,000 grafts respectively. Some clinics in Prague break down their costs too, so in addition to these prices you might need to pay separately for a consultation (around £35), hair growth supplements (around £70) and PRP treatment (around £105). 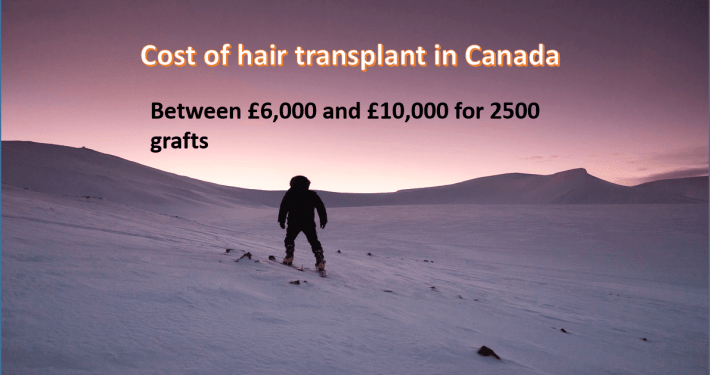 How Much Does a Hair Transplant Cost in Canada? Like the UK, having a hair transplant in Canada is costly, and the costs vary wildly across the country. We’ve found clinics quoting their average cost of a hair transplant in Toronto is £6,070 whereas elsewhere in Ontario, it’s £14,500. Both cover the cost of an FUE hair restoration procedure but no accommodation. As Canada is mainly English speaking, someone from Britain might feel more comfortable without the language barrier but the cost of flights is more than to travel to Europe, where you’ll more than likely find an English-speaking team anyway. 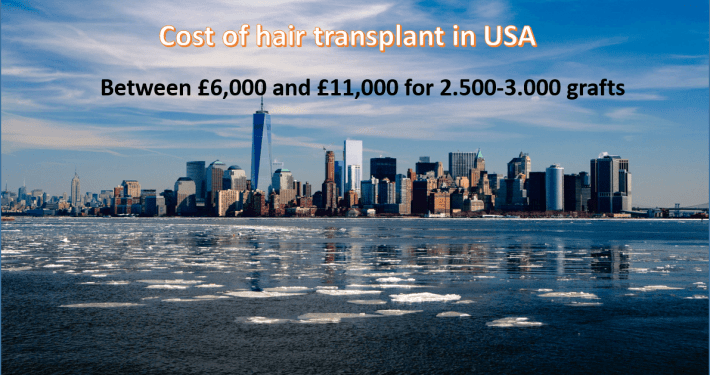 How Much Does a Hair Transplant Cost in USA? America is a vast country and therefore the costs of a hair transplant can vary a lot from clinic to clinic. For example, in New York, the average cost is £4,475, whereas in California its £7,860. We’ve found country-wide quotes ranging from £3,000 to £10,500. Like with having a procedure in Canada, although British speaking, you should also factor in the costs, and length, of the flights. 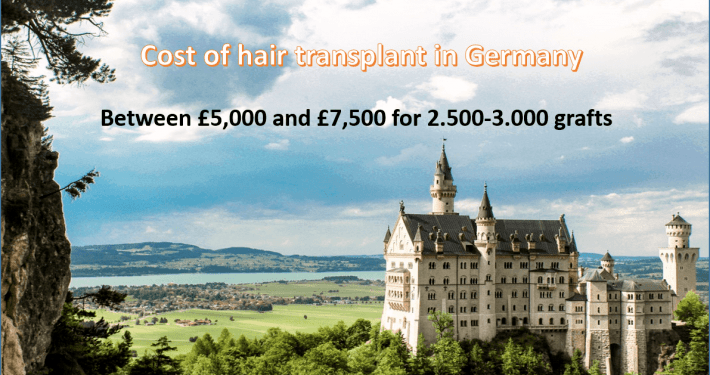 How Much Does a Hair Transplant Cost in Germany? Many UK hair restoration clinics based in the UK are now branching out into Europe, especially Germany in the cities of Berlin and Munich. Plus, there are many established clinics with German beginnings. Many hair clinics in Germany keep their pricing structure hidden until you’ve had a consultation. But we found a couple of clinics who varied in price from £5,000 to £7,500. All clinics offer the FUE hair transplant procedure rather than the FUT. Some also offer scalp micropigmentation, a tattooing technique to colour the scalp to give the appearance of shortly cropped hair. The majority of Germans are fluent in English, so communication is often easy. 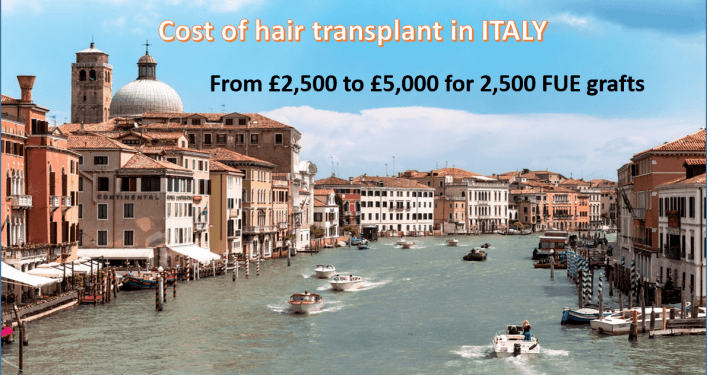 How Much Does a Hair Transplant Cost in Italy? Italy isn’t best known for its hair transplant clinics, but they do exist. Italian hair clinics tend to offer all-inclusive packages, rather like the ones in Turkey do. This would appeal to anyone looking for the clinic to also organize accommodation. However, costs do tend to be more expensive in Italy than in Turkey. We found packages ranging from £2,500 to £5,000 for 2,500 grafts. These clinics offer a free consultation, so that you’d know which cost to expect before you signed up to anything. Packages also include round the clock care, all medical and drug expenses, VIP transfers from the airport and hotel accommodation nearby for three nights. Why Does the Average Cost of a Hair Transplant Differ So Much from Country to Country? A hair transplant is a very specialised procedure. It takes a lot of training, skill and patience. You could be sitting in the surgeon’s chair for six to eight hours and have more than one session. All of this expertise, time and resource costs money. So a hair transplant isn’t inherently a cheap procedure to undertake. If a clinic offers unbelievable prices, they’re probably not to be believed. They will more than likely offer a substandard service and you could end up having to pay more to a different clinic to have the procedure done again. That said, costs do vary from country to country. 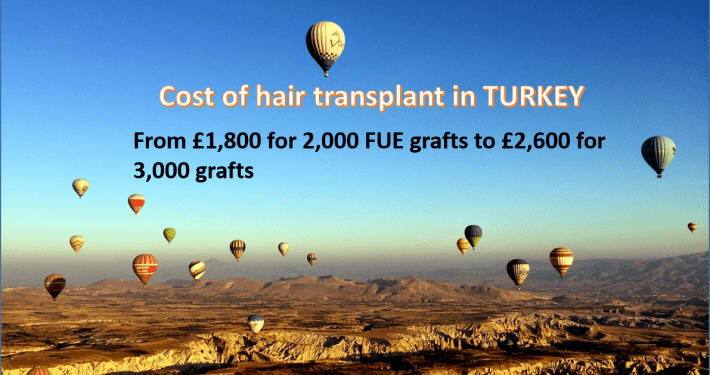 Turkey may be cheaper than the UK to have a hair transplant because the cost of the training, staff, premises, medications, equipment, consumables and accreditation is cheaper. In big UK cities such as London, Birmingham or Manchester, these costs are always going to be higher than in a Turkish beach resort such as Antalya. As you can see, prices do vary. If the clinic you choose offers a price for the procedure and medical costs only, there are other costs you must consider. It can be easy to get carried away, but don’t forget, you need to pay for your accommodation! For most hair transplant procedures, your surgeon will not want to see you heading off to the airport for at least three days! 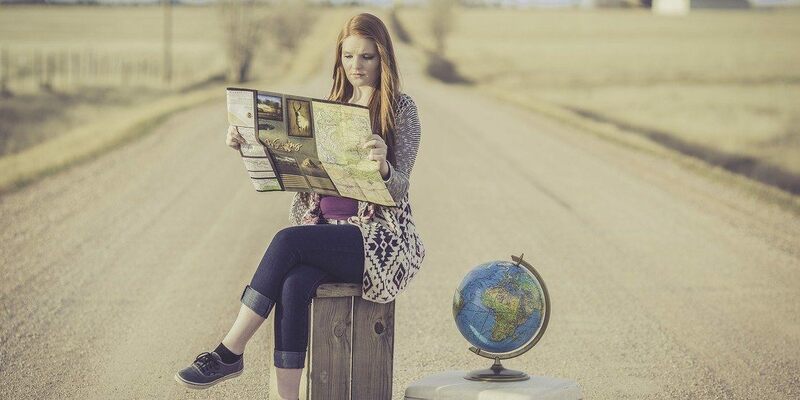 So you’ll need to fund hotel costs for this time, probably considerably longer if you choose to go outside of Europe, such as the USA, India or Thailand. It might seem obvious, but whether your clinic provides accommodation or not, you will be responsible for the cost of your flights and any travel insurance that you might need. We wish you all the best finding the right price, and the right clinic for you! If you’d like to book a free consultation or speak to one of our friendly English-speaking staff, then get in touch today! « Can Vitamin Supplements Stop Hair Loss?